What Day Of The Week Was February 20? 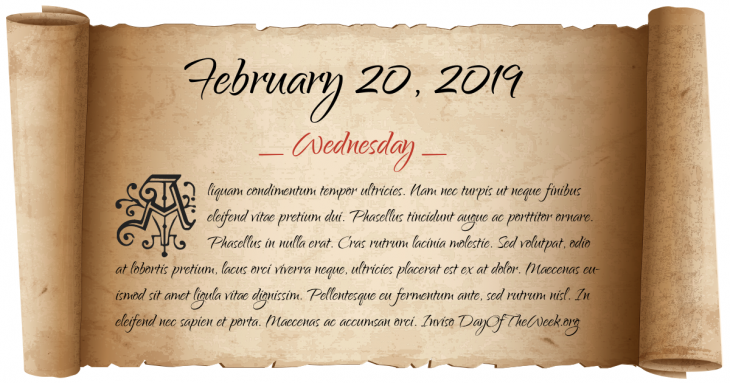 February 20, 2019 was the 51st day of the year 2019 in the Gregorian calendar. There were 314 days remaining until the end of the year. The day of the week was Wednesday. Edward VI of England is crowned King of England at Westminster Abbey. René-Robert Cavelier establishes Fort St. Louis at Matagorda Bay thus forming the basis for France’s claim to Texas. Manuel Belgrano defeats the royalist army of Pío de Tristán during the Battle of Salta. The world’s first professional sports league, the International Association for Professional Base Ball Players is founded in Pittsburgh. New Year’s Day in Chinese calendar. Start of the year of the Metal Monkey in Chinese astrology. Adolf Hitler secretly meets with German industrialists to arrange for financing of the Nazi Party’s upcoming election campaign. Lieutenant Edward O'Hare becomes America’s first World War II flying ace. During a Great White concert in West Warwick, Rhode Island, a pyrotechnics display sets the club ablaze, killing 100 and injuring over 200 others. Who were born on February 20?